In the modern city, where issues surrounding quality of life are perhaps their most distinct, the question of livability raises its head harshly when considering food access. Having the ability to buy food near the place where you live is a factor that determines the standard of living in cities across the world. Globally, as the populations of cities become larger and their social classes more stratified, the availability of food sources is less and less certain. Street food has long remedied these issues, providing a consistent source of nourishment, work, and sociality to the communities it belongs to. Mexican peddlers sell seasoned fruit and boiled corn in California. Along Parisian boulevards, North African immigrants sell crêpes. While it is available in many forms across the world, street food has never been held in high esteem. More recently, however, street food’s reputation has ascended from the unsavory city neighborhood to take on a new identity as an eclectic foodie hotspot. Food trucks paved the road for this rise to new heights beginning in Los Angeles where they had long been upheld as a convenient and economical way for low-income communities to eat familiar foods without hauling them from home. The food truck was forever metamorphosized into an alternative and hip food destination when Chef Roy Choi and his partners brought Korean barbeque to the taco stand in 2008 with the opening of his Kogi Korean BBQ Truck. Two years later, Food Network premiered The Great Food Truck Race. The acquisition had begun. For the modern foodie, what greater food adventure than Asia. Shanghai is particularly alluring as a tourist destination because it is Chinese, which is exotic and alluring in a fetishizing sense, but also is a well-developed city with a healthy infrastructure to support tourism and more reliable standards of living and sanitation. Numerous articles have been written on the matter of street food abroad, naturally. Food has been an essential part of tourism for a while now. However, street food is an enjoying unprecedented appreciation in recent years. Street food in Shanghai is absolutely no exception and what better to portray this recognition than the handy-dandy listicle (a.k.a. an article written in the form of a list). An analysis of the first few search hits on “shanghai street food” give us several similarities and observations. An example of one of the listicles we investigated. Several articles act as convenient encyclopedias to identify various street foods available for the tourist. They generally characterize the various types of food as points on a checklist. 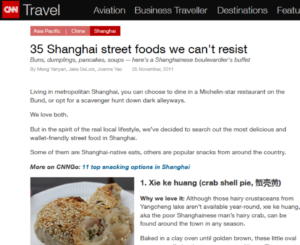 “Don’t Leave Shanghai Without Trying These Five Street Foods” one article is titled. The idea of missing the food at all suggests that the intended audience of the article is a person just passing through the city. Advertising the food to travelers characterizes the food as a fun treat rather than a regular source of nourishment. One article describes meat kebabs “Perfectly seasoned with cumin and paprika, they make for a perfect ending to any night out.” By assigning the food a social context such as a late night alcohol-induced binge, the author turns the food from dinner to beer nuts. Aside from that, the author also takes the liberty to define what is and is not quintessentially Shanghainese street food. These articles generally make these choices with the intention of helping readers find the most authentic experience they can. Generally, authentic entails something very out of the ordinary for the tourist but may forego the items more often taken for granted. For example, fried rice can be found ubiquitously throughout the Shanghai street food scene. The fact that it is so familiar to readers, however, means that the item is seldom mentioned in articles geared toward travellers. A perpetual search for the most authentic of exoticized foods can be interpreted based on the ideas of Roland Barthes and his thoughts on social capital. While being wine-savvy is still held in high regard, the street value of knowledge on the most foreign ingredients and dishes, as of recently, holds value as well. While knowledge of the foods themselves is desirable, even more highly sought after are the locations of the best examples of them. Despite being articles about street food, many of the listicles listed a suggested address to go along with each entry, thus taking the street out of street food. This step may seem contradictory to the search for the authentic however it’s a predictable step as street food becomes destination tourism. Some articles go so far as to list Shanghai’s street food hotspots. Something worrisome about this kind of over-simplification is that the article twists the reality of street food in Shanghai into a treasure hunt rather than realizing that street food is commonplace throughout the city. Another issue with identifying destinations for street food is alteration of practices to suit the new customers. It’s not to say that the new food is inauthentic but rather to note that the food is not necessarily the same thing they came looking for/what the locals eat. In order to investigate this issue, Roz and I visited a couple of The Top-5 Pick of Shanghai’s Street Food Spots. We wanted to see if there were a substantial number of tourists visiting these “hot spots” mentioned in one of the articles. Some of the mentioned places were for a specific vendor, so we chose a place that sounded like it had more of a street food “scene” with multiple vendors, as opposed to searching for one specific vendor. We were directed to a West Fangbang Road near Laoximen Station , as depicted on the map given on the website. When we arrived, however, there was not much to be seen in terms of food vendors. Rather, we saw many mom and pop clothing stores, shoe stores, a few fruit stalls, and various other small businesses. We wondered if there would be more food vendors if we progressed further down the street, but we managed to only find one baozi stall, one youtiao stall, and one congyoubing seller, all spread a fair distance apart from each other. Furthermore, it was a highly residential street, with no other foreigners to be seen except for the two of us. We decided to return to the train station and research a bit more. Turns out we were directed to the wrong end of Fangbang Road, and were supposed to be at the end of the road near Yuyuan Gardens. 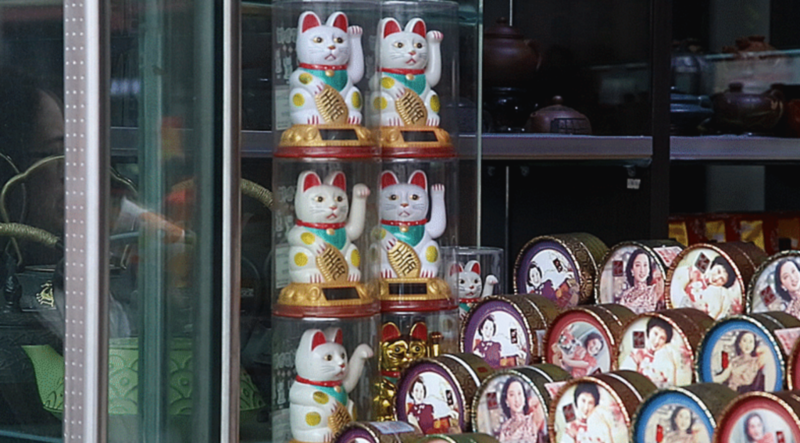 Maneki neko outside the Yuyuan Tourist Market on Fangbang Road. populated commercial street, full of souvenir shops and small clothing stores. The higher presence of foreigners was attributed to the area’s proximity to the Yuyuan Gardens, but I didn’t observe many of them buying street food. We wandered off into a small street a bit away from the main commercial road, and found a very residential community — no fuss or frills that came with the bright lights of the souvenir shops and bus ticket sellers. We saw a woman selling fresh dried noodles, someone selling youtiao, as well as a small wet market that we took a quick walk through. 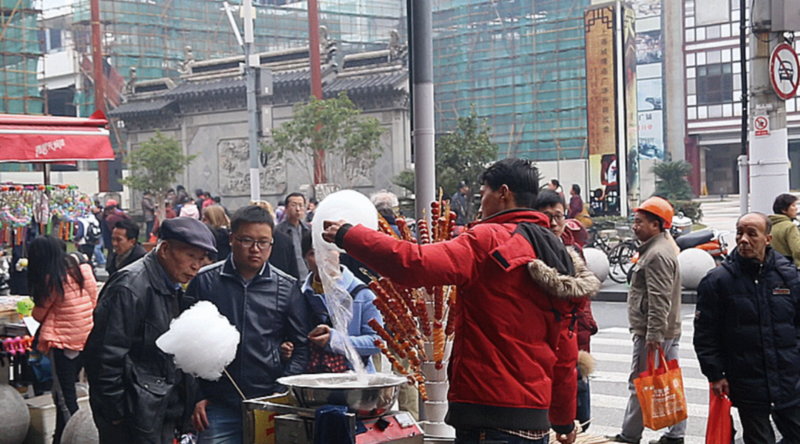 A man operates a stand outside of the Yuyuan Tourist Market where he sells cotton candy and other sweets. street’s proximity to a major tourist attraction. It seems that Shanghai’s efforts to “clean up the streets” has made it harder to find large areas of street food in comparison to the past, which makes following such “hot spot” website guides difficult, as many were written a few years ago. In contrast to the various articles referenced earlier, there are some videos that show a different side to the street food industry. Eddie Huang, chef and owner of Baohaus in New York City, went to Shanghai as part of his Munchies series for VICE. In the first third of the Shanghai episode, he shows a day in the life of a street food vendor named Wang Qiuxiang, who sells grilled skewers/chuan on the intersection of Ningxia Road and Baiyu Road. He doesn’t make any attempts to glamorize her lifestyle, or even depict her as a pitiful person trying to make ends meet. He shows her life for what it is, and her personal view of her lifestyle. It’s her reality, and this video’s approach doesn’t deter the audience from seeing that. The overall tone of the video is quite light, but that is attributed to the attitudes of the subject and interviewer. It does not affect the audience’s ability to see that her and her husband have a less-than-ideal lifestyle. Many of the aforementioned articles do not address street food vendors as whole persons that must maintain certain lifestyles in order to make their living. Rather they just highlight the food being sold and whether or not that food is worth buying. The video, however, addresses Mrs. Wang foremost as a person, a singular identity, who is doing what she needs to to make a living. 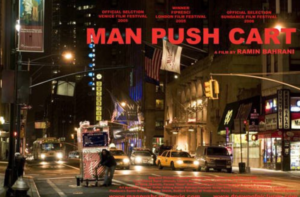 The drama film Man Push Cart takes a heavier approach, depicting someone who doesn’t feel particularly fulfilled by his lifestyle. Although dramatized for the sake of pathos, it does again show the reality of the life for some street food vendors. The protagonist in the film has a very sad story, but none of his customers ever see him beyond his role as their morning coffee guy. It allows the audience remember that the street food vendors are more than just men in carts selling food. There are reasons that they are there, living the way they do. The film sheds light on the protagonist as a whole person beyond the momentary acquaintance of street food vending. While there is nothing wrong with appreciating food, it is important to remember the background behind certain food cultures. 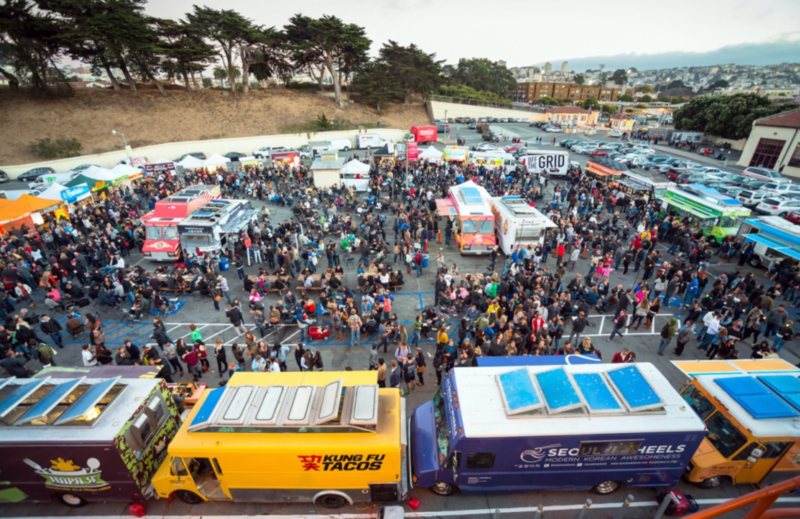 Street food has become a “trendy item” of sorts in foodie culture, particularly in the United States, evident from the rise in the food truck movement. In places like Shanghai, however, street food is a common, necessary part of life, both for the vendors and the customers. There is a lack of regard for the process street food vendors go through in order to be able to sell their products, instead glamorizing and romanticizing the idea of eating exotic foods made by a “local”, who usually is actually from another province in the case of the Shanghai street food culture. This problematic approach to street food also brings into question the idea of authenticity, and who gets to decide what is and is not authentic, detaching ownership from the creators of the food. As the world steams ahead into the urban age of humanity, it is necessary that lessons in cultural respect and ownership be learned early and often to sustain the livelihood of the most at-risk sectors in our society.